The Oracle of Delphi is one of the most important archaeological sites of Greece. Its oracles influenced major and minor affairs around the Mediterranean for about 1200 years before it was abandoned in 393 CE. Accordingly, it has been featured in the itinerary of every traveler since ancient times. This beautiful reconstruction of Delphi Oracle is at the site’s museum. Three-dimensional reconstruction of Delphi Oracle. On display at Delphi Museum, Greece. Reconstructed columns of the temple of Apollo. Delphi, Greece. Panoramic view of ancient Delphi. The temple of Apollo is in the center, the theatre on the left. View of Delphi. The temple of Apollo columns are on the left, and the Treasury of the Athenians on the bottom right. Delphi was a place of immense religious and political influence in ancient times. Private people as well as governments from Greece and abroad came for its oracle before undertaking any major personal or public initiatives. Today, it is a well preserved and respected archaeological site that affords splendid views of both the cultural and physical landscapes of Greece. Today, Delphi is one of the most attractive archaeological sites of Greece. Its rich grounds and museum represent classical antiquity with such clarity even the uninitiated visitor can grasp. Its importance as an archaeological site, coupled with its location at an idyllic landscape makes it one of the most visited sites of Greece. Highligits of the archaeological site of Delphi include the Temple of Apollo, the Tholos, the theater, the stadium, and the treasuries of the Athenians and the Syphnias. The temple of Apollo appears in ruinous state in the center of the sanctuary. Only a few of its Doric columns remain standing, but its imposing foundations are a visible reminder of the Temple’s splendor in ancient times. The present ruins of the temple of Apollo date back to the 4th c. BCE. The Tholos must be one of the most-photographed monuments of Greece, and it has become the trademark image that represents Delphi in many people’s minds. It was a beautiful circular building at the center of the sanctuary of Athena Pronaia. 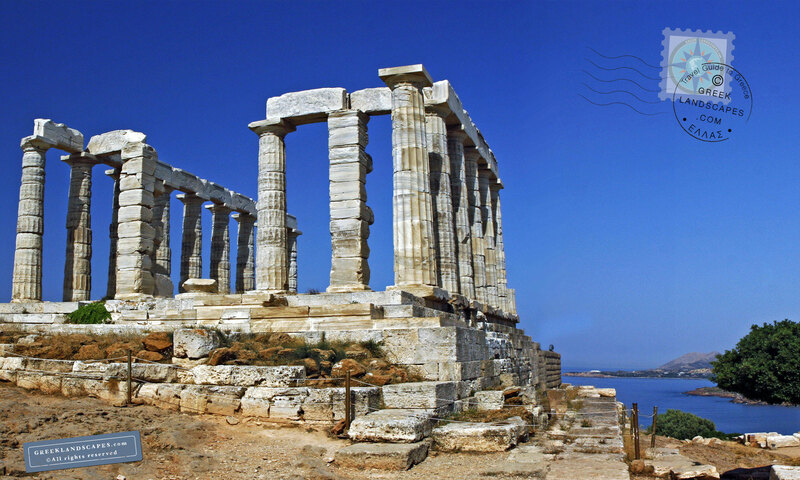 It was built between 380 and 360 BCE, and only three of its original twenty Doric columns remain standing today. You have to walk past the Kastalia spring on the road towards Arachova to reach the complex of Athena Proanaia and the Tholos. The Treasury of the Athenians is on the left. A reconstruction of an Ionic capital at Delphi. It’s located below the retaining wall of the temple of Apollo. Delphi, Greece. The retaining wall of the Temple of Apollo is covered in text, carved on the stones of the retaining wall behind the Stoa. Closeup of ancient Greek text, carved on the Temple of Apollo retaining wall. 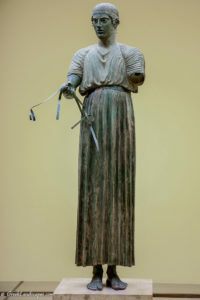 The Charioteer of Delphi. Bronze, 478 BCE. The Archaeological Museum of Delphi is one of the most significant ones in Greece. It exhibits some of the most exquisite art from ancient Greece. In the museum you will see the famous Charioteer of Delphi statue, the gold/ivory statue of Apollo, the ancient Kleobis and Biton statues, and the relief sculptures from the Syphnian Treasury frieze, among many other important artifacts. 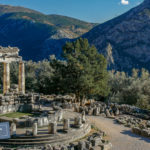 Archaeologist have found evidence that the site of Delphi was inhabited as far back as the Neolithic era, and that by the end of the Mycenaean period (1600-1100 BCE) it had become an important religious and political center of influence. 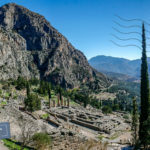 While the function of the oracle during prehistory is obscured by the lack of records, the importance of Delphi during historical times is well documented by a plethora of ancient writers and the rich archeological finds of the site. Delphi was considered by the ancients to be the center (Omphalos = navel) of the world, and the oracle of Delphi was a religious center, most famous for its accurate predictions of the future. The oracles were given by Pythia, the priestess who muttered incomprehensible sounds in a state of trance, which in turn were translated in comprehensible language and give to those who made the pilgrimage in search of answers. Common folk, generals, and kings alike, consulted the oracle of Delphi on matters of importance. Matters of importance ranged from mundane every-day family disputes, to the decision of a state to go to war with another, or to establish a colony. 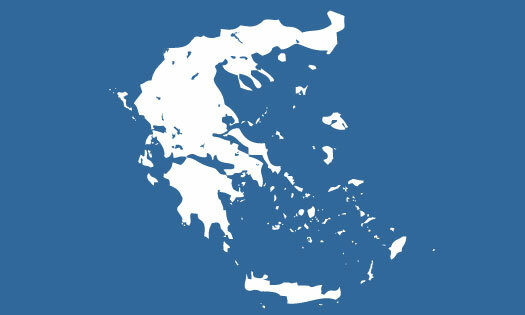 The reputation of Delphi crossed cultural boundaries, and throughout history it held amicable neutrality with its oracles. At the same time, the oracles of Pythia were notoriously ambiguous, and could be interpreted several different ways. 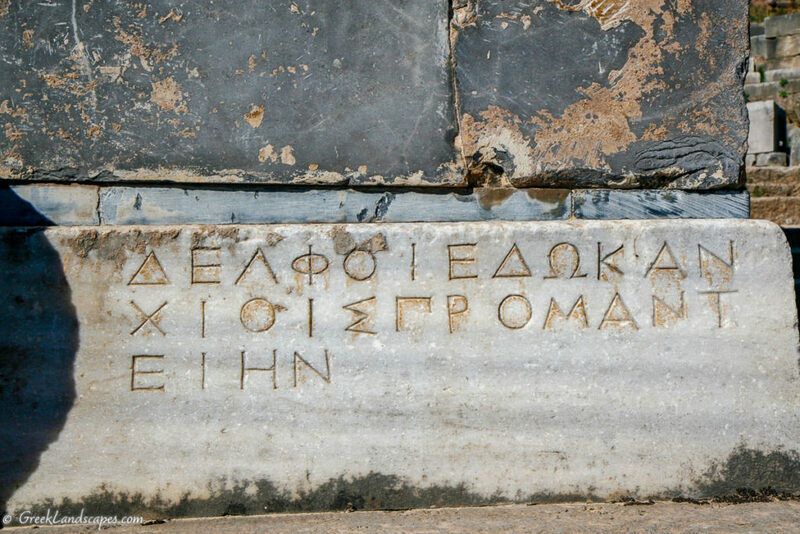 One of the many inscriptions at Delphi. Carved in Marble. 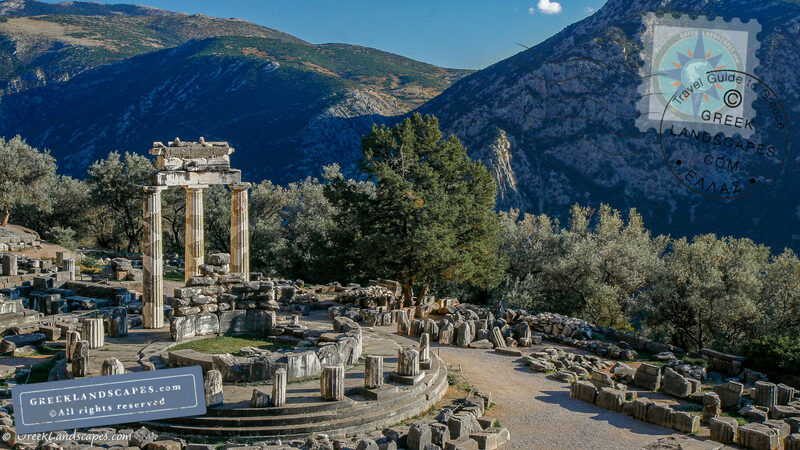 The sanctuary of Delphi spans with its influence the entire gamut of ancient Greek history as we know it. During the Mycenaean era between 1600 and 1100 BCE, Delphi was a place of worship of the Mother Earth deity (Ge), before it was converted to the place of worship of Apollo as the god of light, harmony and order at the end of the 11th c. BCE. Its influence grew over the next few centuries, and by the 8th c. BCE the oracle of Delphi had acquired international fame for its accurate predictions of the future. Throughout ancient times entire communities placed their fate in the words of Pythia, and endless emissaries and worshipers flocked to the sanctuary with gifts and offerings in hoping for a favorable oracle. As a result, the sanctuary was teeming with valuable goods, and affluent states built and maintained elaborate treasuries to shelter the wealth. The treasuries of the Athenians and the one dedicated by the Syphnians are still well preserved on the site, and admired for their beautiful sculptural decoration. The sanctuary remained an important place of worship during the Hellenistic and Roman eras, and it suffered several invasions and looting until it gradually lost its influence with the rise of Christianity. As a place of pilgrimage, Delphi evolved to be hosting a conglomerate of cultural activities, ranging from poetry reading and theatrical plays, to athletic events similar to the Olympics, called the Pythian Games (also known as Delphic Games). The Pythian Games took place every four years to honor Apollo, and hosted poetry and music competitions besides the staple of athletic events. It is believed that the games were first organized sometime in the 11th c. BCE, and included only musical contests, but by the 6th c. BCE, the games grew to include athletic events. The Pythian (Delphic ) games ceased to take place in the 4th c. CE. Prometheus Bound modern revival at the 1927 Delphic Games. Horsemen in Delphi stadium during the 1927 Delphic (Pythian) Games. Photo of Prometheus Bound play in the ancient Delphi theatre. Pythian Games revival, 1927. Scene from Prometheus Bound in the Pythian Games Revival of 1927. These are some rare photos of the Delphic Games revival. in 1927 CE the Greek poet Angelos Sikelianos and his wife Eva Palmer organized the the Pythian games (or Delphic Games) at Delphi once again. The festival only took place that one time. You can get to Delphi by bus from Athens (bus schedules). The trip takes 2.5 to 3 hours each way. By car, to reach Delphi from Athens it takes about one hour and thirty minutes. Drive north on E75, and then east through Livadia towards Itea. While the drive in the first hour is boring and uneventful, it becomes a bit more scenic as you get closer to Delphi. That’s the stretch where the road climbs Mt. Parnasos and passes through the winter resort of Arachova. From Patra, drive north through the Rio-Antirio bridge and then west toward Itea keeping the Korinthian Gulf to the right. The drive is a bit longer (over two hours) and a bit more interesting. The trip as the road hugs the coastline from Naupaktos all the way to Itea, so you will be afforded extended views of the sea. Delphi can be easily be part of a day trip from either Athens or Patra, but should you need a place to stay overnight, the nearby town of Arachova offers a variety of clean and inexpensive accommodations during the summer. In the winter, prices tend to go up since Arachova is a ski resort and many Greeks flock to it to enjoy its snowy surroundings. The smaller, and quieter, village by the name of Delphi is also an excellent place to stay. It does not have the number of accommodations and restaurants that Arachova does, but it has enough for a short overnight stay. The village of Delphi has plenty of hotels as well, and it’s much closer to the archaeological site and museum (10-15-minute walk) than Arachova (15 minutes by car). Click to see Delphi satellite view and to get directions in a new window.